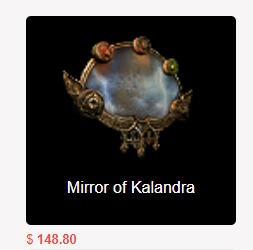 You can buy Mirror of Kalandra with lolga coupon Saving 5%. How can I get Mirror of Kalandra in Path of Exile? Mirrors of Kalandra are the rarest and most valuable currency items in the game. They can be dropped by slain monsters, chests, and destructible containers (including Arcanist’s Strongboxes). They are over a thousand times rarer than Exalted Orbs, and only a tiny fraction of players will ever find one as a drop. In addition, a Mirror can be assembled by collecting 20 Mirror Shards. These are dropped exclusively by Harbingers – albeit very rarely – which are currently only accessible through Zana’s Map Device or Harbinger nodes in the Azurite Mine. Because of their extreme rarity, a Mirror of Kalandra is only used to duplicate the absolute best rare items available – the mirror will be consumed on use! Players that own these top rare items will provide “Mirror service” to players looking to use their Mirrors. Usually, the Mirror is given to Mirror service provider, the item is duplicated, and then the duplicate item is then traded back. This process typically includes a “Mirror fee”, to be paid to the Mirror service provider, as well as some exchange of collateral, so that the original Mirror owner is insured against having their Mirror stolen.